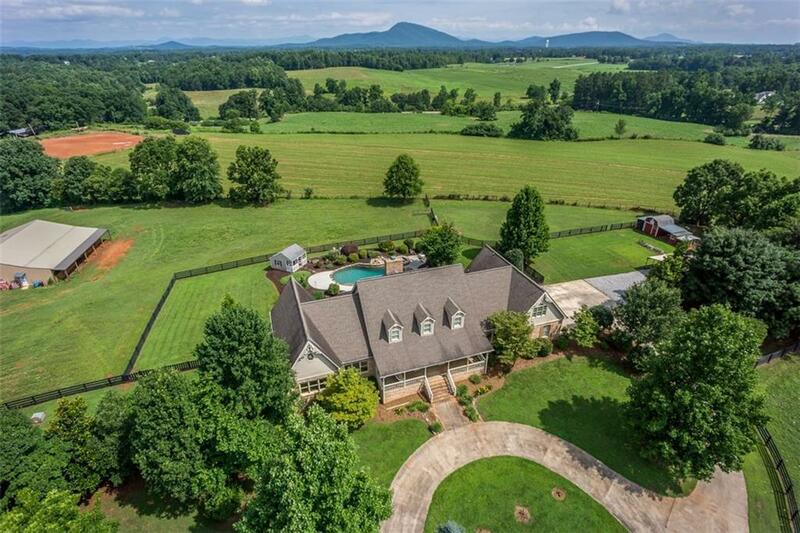 Breathtaking sunrise/sunset views over North Ga mountains from this exquisite 22-acre equestrian property! LISTED BELOW APPRAISED VALUE. 60x60 metal building w/shop, 2 roll-up doors, 4-12X12 stalls & tack room. 3 separate fenced pastures. Kitchen boasts 9' center island. Spacious master w/hardwoods & vaulted ceiling. Impressive two-story great room w/masonry brick fireplace. Screened porch/grilling area & resort-like heated gunite pool/spa & waterfall. Lush, mature landscaping. Pecan, walnut, fig & mulberry trees. 100-yd shooting range. Unfinished basement w/full bath. Directions: From Gainesville 129/Cleveland Hwy To Quillians Corner (Intersection Of 129 And 52). Turn Right On 52, Go One Mile To Fields Rd Turn Right. Bear Right On To Henson Rd. Second House On Right.